Olivet University is pleased to announce that it has partnered with Amazon through AmazonSmile, an exciting program initiated to donate a percentage of its sales to organizations as charity. 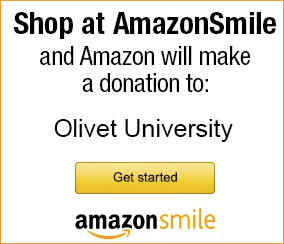 When you purchase through AmazonSmile, the program will donate 0.5% of eligible purchases to Olivet University. All donations will be preciously used for the University's scholarship programs. 3. Start Shopping. When you checkout, Amazon will automatically donate a portion to Olivet. It is free and you will enjoy the same shopping experience while supporting Olivet. We greatly appreciate your support and contributions.